Wow, what a year it’s been and in just over a week’s time we will be opening up the doors of Dinner at the Manor for 2012! We want to bring some Mexican Sunshine for a dull, blustery January and we will be cooking up a storm of zingy, zesty, spicy flavours all inspired from Tomasina Mier’s Mexican Food Made Simple. 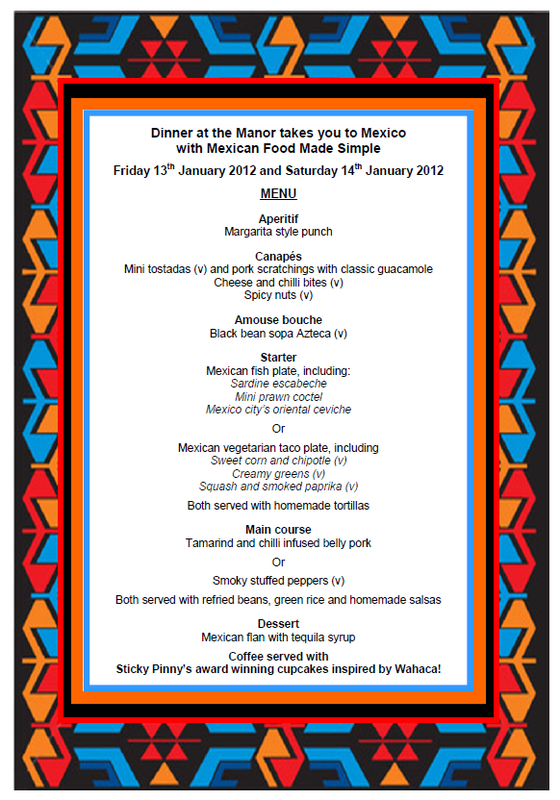 We are so excited about this one – we want to show that Mexican food is more than just chilli con carne and fajitas! We cooked up the pork main and the tequila flan over New Year and I have to say they were some of the nicest things I ate over the festive season! If any of the dishes above whet your appetite, remember, we still have places left at our Mrs Beeton event in March. This entry was posted in Menus, Upcoming Events and tagged Leeds, Menu, Mexican, Supper Club, Underground Dining, Underground Restaurant, Wahaca on January 5, 2012 by Susie Barker.